RDS April 30, 2018. AATIP or AAWSAP? 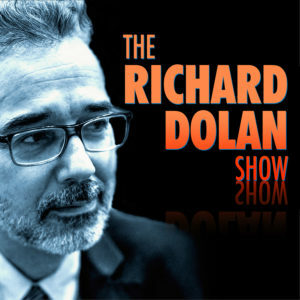 This episode of the Richard Dolan Show aired on KGRA radio April 30, 2018. The first hour is concerned with recent claims that the Pentagon’s UFO program known as Advanced Aerospace Threat Identification Program (AATIP) may in fact have gone under another name as well: Advanced Aerospace Weapons Systems Application Program (AAWSAP). It seems the study of UFOs is nothing without some controversy. Richard interviews two guests, first Chase Kloetzke, who has interviewed Luis Elizondo twice and provides her insights. Second, he interviews Australian researcher Paul Dean, who has concluded that AAWSAP is indeed related to AATIP. 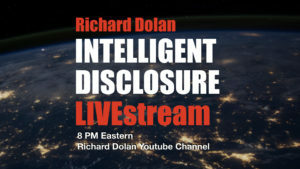 During the second half of the program, Richard discusses the implications of these developments as well as examining some darker implications of the strange phenomena of our world, drawing mainly from the research of David Paulides and Whitley Strieber. Hi Rich – Whatta show!! That Paul Dean (Mr. Kimball) can really get going!! That was a little difficult to follow along with … nonetheless – you two smoked it!! Absolutely loved your discussion on the Paulides/Strieber phenomenon – MORE of that I can take – anytime!! Thank you for putting this site together and for doing your weekly show – I’m a bit slow coming to the party (your shows) – but so glad to be a member! HI Richard, we love the podcasts and this new site. After listening to this podcast I went to your News page and there is an article ( UFO investigations in US and UK hampered due to demonic alien fears) that say some interesting things with regards to the AATIP and comments by Luis Elizondo. Obviously it’s an article and not sure it can be proven unless he actually has replied to this. This was the comment, Luis Elizondo, who worked formerly as an intelligence official said that the secret mission was pushed back by the senior officials due to their feeling that the study could prove to act as a matter of humiliation for their department and due to the study’s conflict with the official’s religious terms. Elizondo had also spoken regarding the five-years-old study previously in the year 2017. He said that the government stopped funding in the year 2012 but the program continued because of the resources provided by the CIA and the US Navy. This is funny that I saw this as my husband has a very religious family (he is not religious) but his family thinks they are demonic. I’ve heard this before from others. So they religion? Hmmm. Any thoughts and did I put this question is the correct place? Still making my way around your new website.